The Pinwheel Galaxy, also known as Messier 101 (M101) and NGC 5457, is one of the best known spiral galaxies in the night sky. M101 is a grand design spiral galaxy (a spiral galaxy with prominent and well-defined spiral arms) located in the constellation Ursa Major, the Great Bear. The galaxy appears face-on when observed from Earth, and is a popular target for both amateur and professional astronomers. To observe the spiral structure in M101, one needs a larger telescope, a low power eyepiece, and little to no light pollution. In a smaller telescope, only the bright central region is visible. The spiral arms begin to appear as nebulous patches in 4-inch telescopes, and views in 6-inch and larger telescopes are significantly more impressive. M101 has an apparent visual magnitude of 7.86 and is approximately 20.9 million light years distant from Earth, which means that we are seeing it as it was about 20.9 million years ago. The Pinwheel Galaxy contains hundreds of billions of stars and is notable for its many large, bright star forming regions. Various images of the galaxy reveal about 3,000 of the H II regions, ionized by bright hot young stars. The galaxy is believed to have had an encounter with another galaxy in the past. It appears asymmetrical on one side and this is thought to be a result of the collision. The intense star forming activity in this region is another outcome of the interaction between the two galaxies. 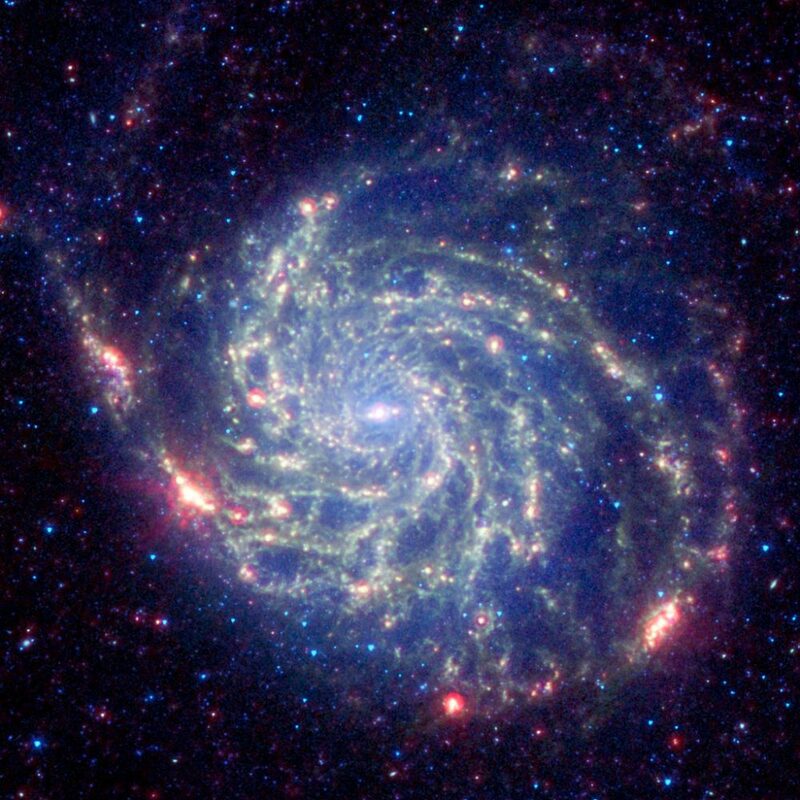 The Pinwheel Galaxy is about 170,000 light years in diameter, which makes it roughly 70 percent larger than our galaxy, the Milky Way. 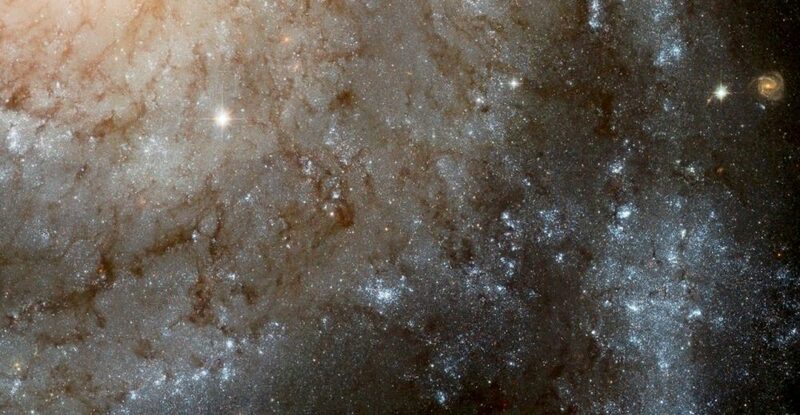 The galaxy’s disk has 100 billion solar masses, while the bulge has about 3 billion solar masses. 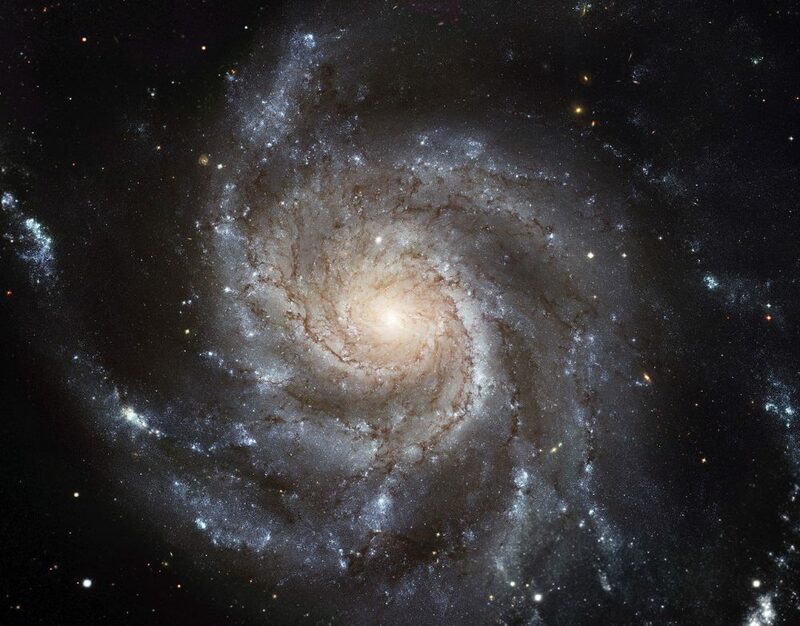 The Pinwheel Galaxy was discovered by the French astronomer Pierre Méchain on March 27, 1781. Méchain notified Charles Messier of his discovery, and Messier included the galaxy in his catalogue as the 101st object. The Anglo-Irish astronomer Lord Rosse was the first to document the galaxy’s spiral structure in more detail. He observed M101 in a 72-inch Newtonian reflector in the second half of the 19th century. The Pinwheel Galaxy has several prominent companion galaxies: the irregular spiral galaxy NGC 5204, the peculiar dwarf galaxy NGC 5474, the dwarf galaxy NGC 5477, the spiral galaxy NGC 5585 and the irregular galaxy Holmberg IV (UGC 8837). M101 is the brightest member of the M101 Group, a group of galaxies in Ursa Major that includes the Pinwheel Galaxy’s companions, UGC 9405, and several other galaxies. The M101 Group is one of the many groups of galaxies located within the Virgo Supercluster (or Local Supercluster), an irregular supercluster that includes the Local Group of galaxies (which includes the Milky Way and Andromeda Galaxy) and the Virgo Cluster, a cluster of galaxies whose centre is located in Virgo constellation. To find the Pinwheel Galaxy, first locate the Big Dipper asterism in Ursa Major. Then look to the two stars at the end of the handle (or the bear’s tail), Alkaid (Eta Ursae Majoris) and Mizar (Zeta Ursae Majoris). Find the midpoint between the two bright stars and draw a line up. M101 appears at a point where it would roughly form an equilateral triangle with the two stars. The Pinwheel Galaxy can be found in 40mm and 50mm binoculars, but it only appears as a hazy patch. To see the galaxy’s bright nucleus and faint spiral arms, you need at least a 4 inch telescope and very dark skies. M101 is quite large, but relatively faint, and not easy to observe with smaller instruments. It is best seen with a low power eyepiece, without too much magnification, as the object is large and you can end up looking right through it. Good viewing conditions are essential because the object is too diffuse to be seen from areas where there is too much light pollution. A Type Ia supernova, SN2011fe, was discovered in the Pinwheel Galaxy on August 24, 2011. It was originally designated PTF 11kly. 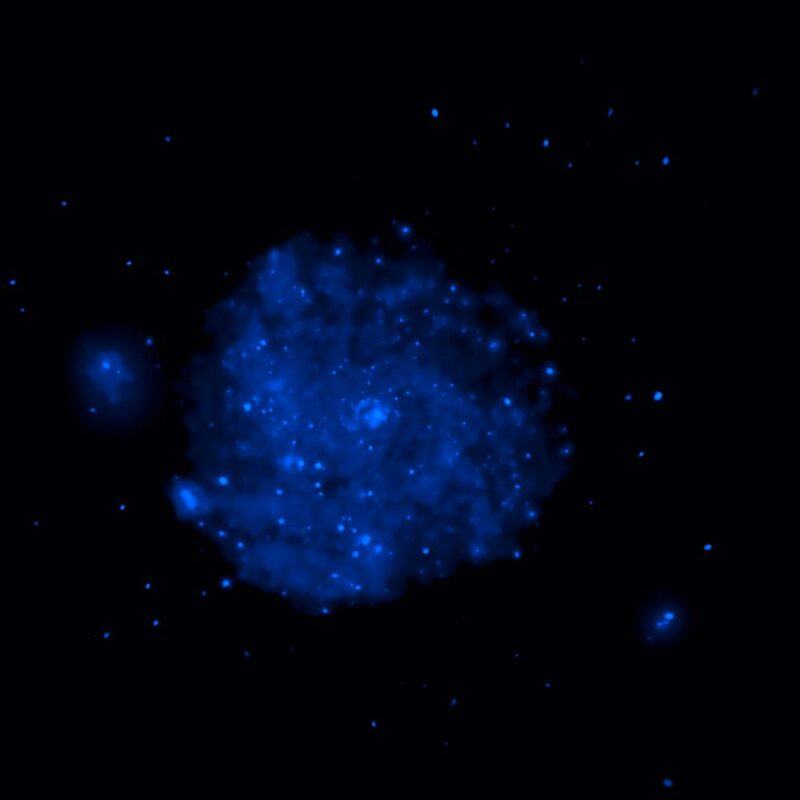 Type Ia supernovae occur in binary star systems that consist of a white dwarf and another star, which can be anything from a giant to another white dwarf. White dwarfs with low rotation rates are limited to a certain mass (1.38 solar masses), known as the Chandrasekhar mass, beyond which they become unstable and in some instances trigger a supernova event. In a binary system, a white dwarf can slowly accrete mass from the companion star and, as it approaches the limit, its core reaches the ignition temperature for carbon fusion. As all white dwarfs that explode after accreting too much mass from their binary companions have the same mass (the Chandrasekhar limit), Type Ia supernovae produce consistent peak luminosity and can be used as standard candles to measure the distance to the galaxies in which they are located. The apparent magnitude of the supernova explosion will depend mainly on the distance, making it easy to measure. 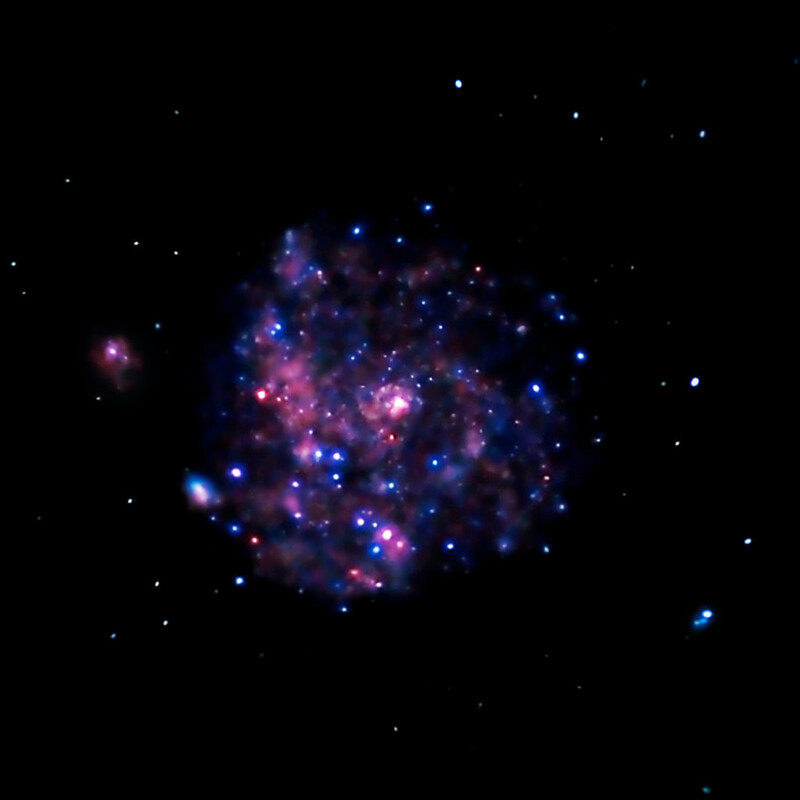 The supernova explosion observed in 2011 had an apparent visual magnitude of 17.2 when it was first discovered, and later reached a peak magnitude of 9.9. This was the fourth supernova observed in the Pinwheel Galaxy. The previous three were documented in January 1909 (SN 1909A, discovered by the German astronomer Max Wolf, with a peak magnitude of 12.1), in September 1951 (SN 1951H, with a magnitude of 17.5), and in January 1970 (SN 1970G, with a magnitude of 11.5). 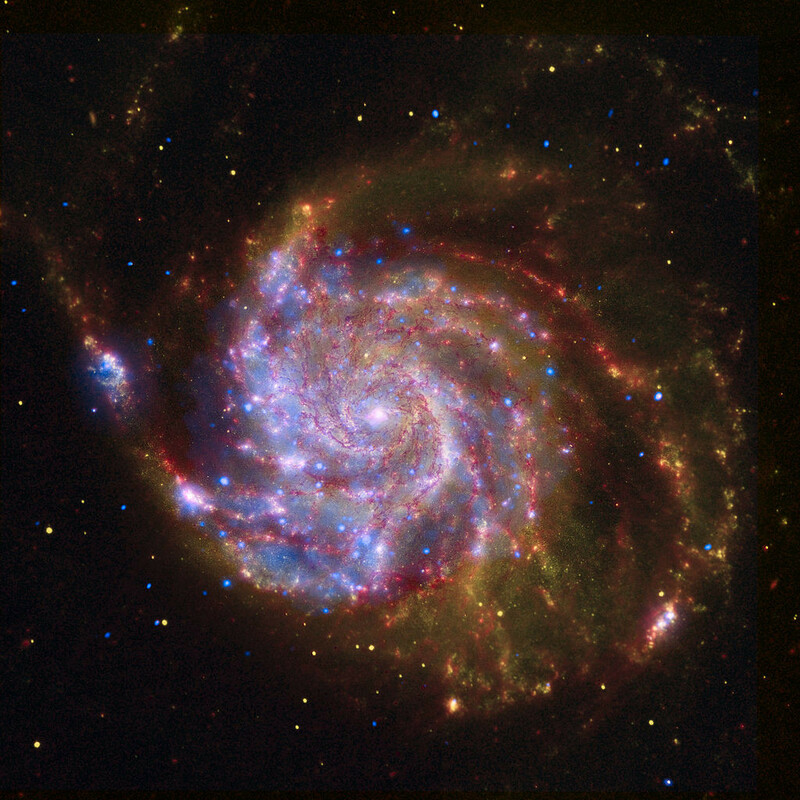 This Chandra image of M101 is one of the longest exposures ever obtained of a spiral galaxy in X-rays. The point-like sources include binary star systems containing black holes and neutron stars, and the remains of supernova explosions. Other sources of X-rays include hot gas in the arms of the galaxy and clusters of massive stars. These X-ray observations of M101 will be used to establish a valuable X-ray profile of a galaxy similar to the Milky Way. This will help astronomers better understand the evolutionary paths that produce black holes, and provide a baseline for interpreting the observations of distant galaxies. Image: NASA/CXC/JHU/K.Kuntz et al.